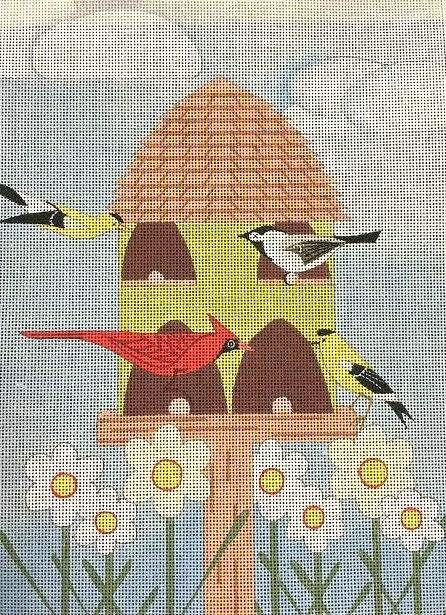 This handpainted contemporary cardinals around a birdhouse needlepoint is by Maggie Co. The design area measures approximately 12" x 8". This brightly colored needlepoint comes with or without fibers. If you select cotton we will send DMC cotton floss. For wool we will send Bella Lusso, and silk we use Planet Earth Pepperpot boutique fibers which are single-ply for 18 mesh. This cardinals and birdhouse handpainted needlepoint canvas usually ships within 1 week.